"Grateful for her service to all of us as we grew up in..."
"I am so sad to hear of her passing. When she was the..."
"I remember, as kids, Ann would invite me to spend the night..."
"Mrs. Pettyjohn was such a caring and loving lady. She was a..."
with the kindness in her heart." Nina Pettyjohn was a beloved teacher and librarian in Washougal, WA where she made a positive impact on so many. She loved to tell stories of her life and world travels and had a memory for detail that brought them to life. Nina Pettyjohn was born Nina Rosila Kiesling on Dec. 8, 1917 in Havre, MT to John and Donnie Kiesling. Graduating from high school at the age of 16, she went on to get her teaching certificate from Northern Montana College and began teaching in a one-room schoolhouse in Montana at the young age of 18 making $960 for the entire year. 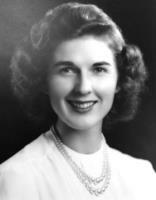 In 1941, Nina attended the Kinman Business School in Spokane and as World War II broke out, Nina moved to Seattle and joined the Civil Service. While there she met her life-long love on a ferry boat ride, Lyle Pettyjohn, who was a young Marine fighter pilot. Six months later they were married on April 10, 1943 in Seattle. After the war, Lyle finished his education at the University of Oregon and began his teaching and coaching career in Toledo, Oregon. The young family moved to The Dalles in 1952 and finally settled in Washougal in 1957. Lyle went on to coach Washougal's football team to more than 100 wins. Nina resumed her teaching career and went on to get her BA and Masters Degree in Library Science from the University of Portland. The Pettyjohn home on the Little Washougal River was the location of choice for picnics, parties and dinners for the football team, honor society and church groups. Nina achieved her childhood dream of going to China in the 1980s and was among the first group to visit when it was opened to tourism. An avid reader, Nina particularly enjoyed curating children's literature. She enjoyed book club, creating numerous needlepoint treasures for family and friends and was a blue ribbon cake baker. Nina retired in 1983 as Librarian for Gause and Hathaway schools, and in December of the same year Lyle passed away. Nina moved to the Quarry in Vancouver, WA in 2010 where she lived until she passed away on Dec. 1, 2017. She is survived by her children: Bruce Pettyjohn, Wilkes Pettyjohn, David Pettyjohn and Ann Pettyjohn; seven grandchildren; seven great-grandchildren; and one sister, Betty Lu Kulp. Nina was preceded in death by her parents; and two brothers, Robert Kiesling and Victor Kiesling. 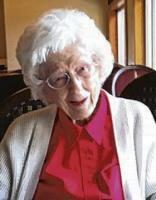 A celebration of Nina's 100 Years was held at the Quarry Senior Living for more than 100 friends and family on Nov. 2nd. At Nina's request, the family is foregoing a memorial service. In lieu of flowers, donations can be made to the Salvation Army.